"With a cosmetic procedure as intimate as a hair transplant, the care from the staff becomes just as important as the outcome of the procedure. At Alvi Armani, you immediately feel comfortable due to the discreet, caring, and trustworthy staff. Your initial interactions will most likely be with Jeff, who will go to any length to answers all your questions and concerns. He is extremely available for follow up questions and returns calls promptly. 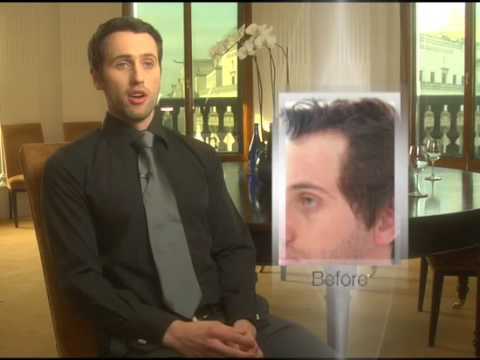 Dr. Baubac is a gifted doctor who sets you at ease with a thorough analysis of your hairline and gives great recommendations based on your desired outcome. The 30 days after the transplant are the most important, and Claire plays a crucial part in the success of the procedure. She not only offers daily washes on your time schedule, but she is also extremely knowledgable and answers all the hard questions that you have during these less than aesthetically pleasing 30 days. After the 30 days, it's a waiting game, but the staff at Alvi Armani doesn't forget about you. They check up on you to see how things are going, have you come in at six months to evaluate and make sure things are right, and they even check in after a year to make sure their work surpasses your expectations. I was very nervous about having this procedure, but it is the best decision I've ever made. And I feel fortunate that I was recommended by a good friend to Alvi Armani because they made the experience pleasant and gave me great results." My experience with Alvi Armani has been fantastic. Dr. Baubac as well as his staff were very welcoming and made any doubt or nervousness disappear upon arrival on surgery day. The staff's expertise and professionalism was impressive, they worked tirelessly till i achieved the hairline i desired - over 12 hrs, when the surgery was projected to be 8 hrs. I never felt like they rushed the procedure, they took their time, played music, made me relaxed, chitchatted with me, made some jokes and shared some laughs. Dr. Baubac even gave me a ride back to my hotel when we finished the procedure after midnight. It was these little details that made my experience so great, they treated me as a friend rather than a hair transplant candidate. The weeks following, I received followup from the Alvi Armani staff, ensuring that I was following post-op instructions and that I was recovering appropriately. They were always so kind and answered all of my questions. I can't recommend Alvi Armani enough - you would think I was an A-list celebrity due to the gold standard quality I had received, but rather I was just a regular Joe who received superior service. Dr. Baubac and the Alvi Armani staff have displayed the upmost genuine care, concern and professionalism through my hair transplant procedure and journey. Everyone at Alvi Armani has really exceeded my expectations. Everything from the prep of the procedure, the procedure itself, post surgery and weekly and monthly post surgery check ins. Since day one I have always been encouraged to ask questions about anything (pre surgery, post surgery, post care instructions etc) and Alvi Armani is always there to answer them with great knowledge, genuine care and concern. I trust Alvi Armani and would highly recommend Alvi Armani to anyone thinking about a hair transplant. Dr. Baubac provided me with services that exceeded my expectations every step of the way. It is my pleasure to recommend him and his entire team on the basis of their skill, professionalism, and attentive care throughout the entire process. Dr. Baubac is really good at what he does. The whole staff and experience was really great. I couldn't be happier on how I was treated. Thanks for everything. Everything, as expected, was amazing. The care and attention the team displays at the Beverly Hills clinic is exceptional. The result that Dr Baubac wanted to achieve is once again, proof that Alvi Armani is in this business to change lives and make people happy, he certainly did that! It was everything I expected and more. We spent a lot of time pre-op talking about design, about my mixed ethnicities and how that plays into the aesthetics of my face and where my hairline lands, drew out a preliminary line we all liked and then the next day spent quite a bit of time fine tuning it until we hit on the winner. My wife and I were completely impressed and pleased with the design and the result. Dr. Baubac's demeanor was also just amazing - calm, helpful, supportive, informative - and he had a real eye for design. I could tell he wasn't just taking measurements and applying a formula - he was going for a felt-sense of the aesthetic, which is exactly what I was wanting in a hair transplant doctor. My experience with Dr. Baubac and all members of his staff was awesome! Dr. Baubac definitely has some big shoes to fill as Dr. Armani was amazing, but Dr. Baubac surpassed all of my expectations. He was absolutely wonderful and his staff were incredible. They were very personable and thoughtful and just gave me the VIP treatment from minute 1 through the end of my procedure. I honestly could not be more impressed with his team - top notch. I would recommend them to anyone and would not hesitate for a second to go back to the Beverly Hills office. Thanks again for all your help. I first wanted to say that this hair transplant changed my life and I couldn't be happier with the effects and confidence it has given me. I am truly grateful for all that you and Dr. Armani have done. have no words for Dr. Armani. He is out of this world, a very talented surgeon and is indeed a amazing personality. He took very good care of me. My overall experience at the Armani Clinic was wonderful. The staff are very knowlegeable and caring. The facility is state of the art and the after care is second to none. My experience with Alvi Armani was wonderful! I deal a lot with celebrities and I can say that Alvi Armani gave me the celebrity treatment all the way through. I felt very welcome and also all my questions were answered prior my op. The FUE technique was comfortable and healing process was fast. I received also a top quality post care. The entire team was amazing. Dr. Hayatdavoudi is a very caring doctor, and it comes through in his work. All in all, a very positive experience. Dr. Baubac Hayatdavoudi, Jaques and the whole team are extremely personable, professional, caring and genuinely nice to be around. Dr. Baubac Hayatdavoudi felt more like a friend than a doctor and he was one of the most selfless, modest and humble people i have ever met. August of 2010 with Dr. Hayatdavoudi in Beverly Hills (an additional 500 grafts to thicken it up). Both procedures were done with exceptional professionalism. To keep it recent, my procedure in Beverly Hills was a great experience. I couldn't have picked a better doctor and clinic for my procedure. I can't say enough great this about Dr. Baubac Hayatdavoudi. He's truly a fantastic person and an extremely professional doctor. I have to say, I was very impressed from the beginning with Dr. Hayatdavoudi; he is very kind and compassionate and really listened to all of my concerns and thoroughly answered all of my questions. I can see why Dr. Armani selected him to run his Beverly Hills clinic, his bedside manner is 2nd to none. I was impressed with how kind and compassionate Dr. Hayatdavoudi was and how thorough he was with everything. He clearly is in the right line of work. have to say overall Dr. Baubac Hayatdavoudi really put my mind at ease. I'm glad I was able to actually go to the clinic and get a feel for what I can expect before hand, instead of being shell shocked the day of. The consultation went great. Dr. Baubac Hayatdavoudi is amazing to say the least! He spent an hour with me before my procedure discussing what exactly he is going to do and answering any questions that I had. Just like Dr. Armani, he is extremely courteous and conscientous of his patients and their needs. Dr. Baubac Hayatdavoudi is in a class of his own. Both as a person, as well as a fantastic surgeon and artist. Dr. Baubac Hayatdavoudi's staff are very professional and extrecmely nice. They made time go by very fast we talked and laughed the entire time during the procedure I couldn't have asked for any more I felt as if I was at home! My overal experience with Alvi Armani and the LA staff is A+ and I highly recommend Dr. Baubac Hayatdavoudi to anyone looking for a highly skilled professional Dr.and staff. Dr. Baubac Hayatdavoudi is a great doctor he did an amazing job covering the areas that I needed done the most by utilizing each graft to suit my look and style. My procedure with Dr. Baubac Hayatdavoudi went fantastic! The entire day went very smoothly and I am ecstatic with the initial results. I am very excited to see how the development progresses in the months to come. If you are looking for a clinic for your HT Dr. Baubac Hayatdavoudi and Alvi Armani deliver incredible results!